Can’t afford an iPhone (or don’t live in the US) but eager to check how your site might look on the hottest device of the moment? Enter the iPhoney: a small (1.3MB) desktop application that simulates web browsing on the newly released device. iPhoney is not an iPhone simulator but instead is designed for web developers who want to create 320 by 480 (or 480 by 320) websites for use with iPhone. It gives you a canvas on which to test the visual quality of your designs. This cleverly named app is a great tool for developers who want a rough idea of whether their site will be usable by the one million iPhone owners who signed up in the first six days. With sales like that, it’s conceivable that, within a few years, visitors browsing on an iPhone could amount to a significant percentage of your site’s visitors. You can instruct it to send the iPhone User Agent string, in case the site you’re checking performs any content negotiation based on this string. You can quickly rotate the viewport, as you can on the real thing. 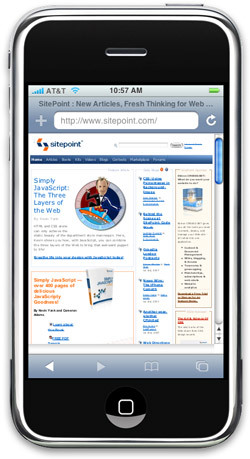 Resizing your browser just isn’t as much fun as loading up an iPhone look-alike on your screen. iPhoney is only available for Mac at this point, although given the recent release of Safari for Windows, and the fact that the code has been open sourced, I imagine that a Windows port is not far off. Ah, the beauty of having users who are passionate about your product — they’ll create stuff that supports and promotes it all on their own! I don’t know why phone companies don’t offer something like this as a free download — what better way to promote your phone, while at the same time providing a way for developers to ensure that the Web works as it should for more customers?